If the tragic dogfighting case involving football star Michael Vick can be said to have anything resembling a silver lining, maybe this is it. 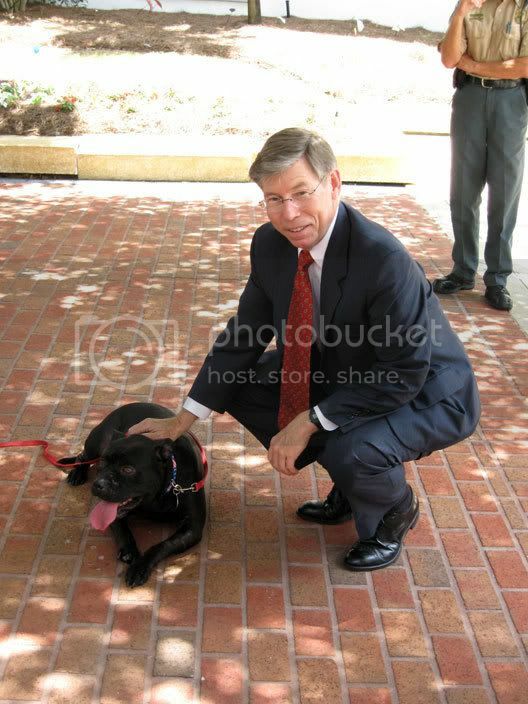 The Humane Society of the United States traveled to Florida's capital this week to unveil a new national reward program targeting animal fighting. The program -- which will offer up to $5,000 for information leading to the arrest and conviction of any person involved in illegal dogfighting or cockfighting -- is funded by the donations that poured in after Vick's arrest last year. The suspended Atlanta Falcons quarterback is now serving 23 months in federal prison for his role in an interstate dogfighting ring based at his Virginia kennel. Amy Raddar, an animal shelter volunteer, has adopted Winston. She said he gets along well with her four children, two cats and four other dogs, including two more pit bull terriers. "Knowing him and his gentle soul, I think he probably wasn't mean enough to be the top fighting dog," she said. "So I think they used him to train their other dogs."